Mira Element > Exposed Thermostatic Shower Valve With Slide Rail Kit (Chrome). 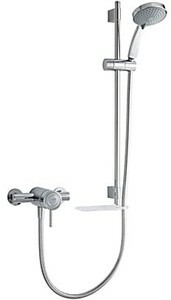 Mira Element SLT EV exposed thermostatic shower valve in chrome with slide rail kit. 5 spray showerhead with rub-clean nozzles.